Following on from Owen’s bike check post, and wanting to build his confidence on the bike, I put his bike in the boot of the car when we went for our usual Friday afternoon trip to the park. When we got to the park he was excited to put his helmet on and got on his bike, excited for the 100m ride from the car park to the playground. However we didn’t get out of the car park, before Owen gave up. He then seemed annoyed at me having to carry the bike all the way to the playground. After a fun session on the swings, slide and roundabout, Owen was again keen to get back on his bike – but this time rode it all the way back to the car park! I was so proud of him, as this was much further than he’d been on his bike before. Owen seemed pleased with himself too, as when he got home he got straight back on his bike to show off to Jen! 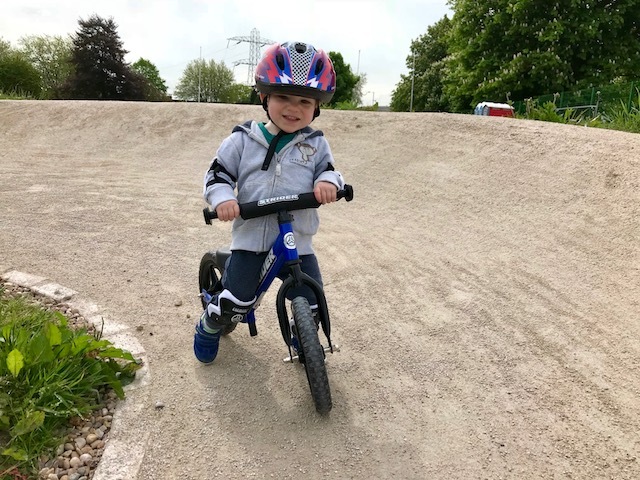 The next morning, Jen had a Eurovision party to prepare for, so based on the previous afternoons’ success I decided to take Owen to Ready Steady Riders, which is a Strider balance bike coaching session, on a special mini BMX track, next to the Perry Barr BMX track in Birmingham. Owen had a bit of a tantrum when we got there, as I wouldn’t let him ride his bike in the busy car park, but he really didn’t want to walk! After carrying both Owen and his bike to the safety of the park, I let him set off again on his bike. It was about 200m to the gate for the BMX and Owen made it most of the way, only needing to be carried for the last section. However, when he saw that there were other little boys there on their bikes, he was straight back on his! The Strider track was awesome, a starting gate, four straights with bumps and jumps, connected with three big berms finishing off with a little banked chicane. Owen was so excited when he saw it, joining the track at the nearest place! Owen’s legs weren’t quite strong enough to get him up the bumps on the straights, so I needed to give him a helping hand, and also occasionally catch him on the down slopes, but even on this first lap his riding improved from beginning to end, he was getting more confident and obviously enjoying himself. At the end of the lap he was keen to get back for another one, this time tackling the berms on his own and using his feet to brake. We did a few more laps like this, Owen was the slowest rider there, but then 24 hours previously he’d only ever ridden the length of our garden! Kazzi, the coach, took over helping Owen round for a lap, which he seemed to respond well to. By this point he was really enjoying himself, making “wheeee!” sounds down all the slopes and carrying a bit more speed. I could tell that all the excitement was starting to tire Owen out, he gets very stubborn when he is tired, and it was about his usual nap time, however we still had more of the session to run. About this time Owen started to take an interest in the start gate, the faster kids were using this for the start of their runs and Owen thought it looked fun. So we climbed up the hill and Owen took his place, for the start. 3, 2, 1, go! The riders surged forward towards the first hump on the track. Owen didn’t want to go over the hump to start the lap, he wanted to go back to the gate to do more starts. After a few of these, he decided that the bike was an inconvenience. Kazzi knew straight away how to sort this, asking Owen if he wanted to try her daughter’s bike – which worked for half a lap! After a few more starts, and falls on his own bike, Owen decided that he was going to have a go at climbing the first hump on his own, getting upset at my offers of assistance, but even more upset that he couldn’t do it. After screaming at the hump, and at me, he decided to ask for his cot! Easier said than done when you are in the middle of a park! Getting a tired and grumpy Owen back to the car, along with his bike and safety gear wasn’t an easy task. Every few metres he wanted to be carried/to walk/to go on his bike or to have his helmet or kneepads taken off or put back on – all classic signs of a tired Owen. When we eventually got back to the car, Owen did his usual trick of demanding to “drive” (to sit in the drivers seat), which was handy for keeping him occupied whilst I loaded the car. When I got him into his seat in the back he was asleep within minutes, barely waking up when we got home and Jen transferred him into his cot. I’ll definitely be taking him to Ready Steady Riders again, hopefully before the race he’s been entered in next month. On the Sunday, Owen wanted to play in the lane behind our house, jumping in puddles – that bloody Peppa Pig has a lot to answer for… Unlike Daddy Pig, I’m not a fan of puddles, especially in my new Danny Macaskill Five Ten shoes, so I decided to get my bike out and practice some skills whilst Owen splashed around. Seeing my bike made Owen want his bike, so I got it out, got his helmet on and we went on our first bike ride together! It was only up the lane behind our house, but it was a good little adventure, we met some friendly dogs and explored the top section of the lane which is a dead end. Owen fell off his bike whilst turning round at the top, and couldn’t be persuaded back onto the bike, so I ended up carrying/pushing the bikes back to the house – I’m sure Owen will learn soon enough that the downhill bits are the fun bits and I’ll be pushing/carrying the bikes up the climbs! I’m so proud of the progress that Owen has made on his bike this weekend and the fact that he now seems to be enjoying his balance bike, rather than being scared of it. 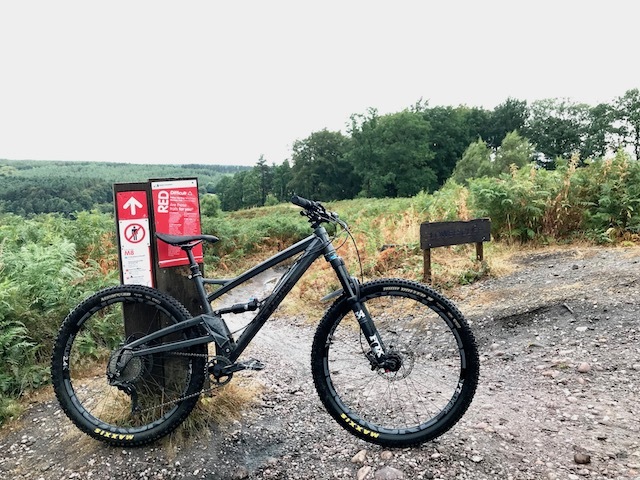 The photo at the top of this post has even made it onto the lock screen on my iPhone, as seeing Owen enjoying his bike is one of the best feelings! 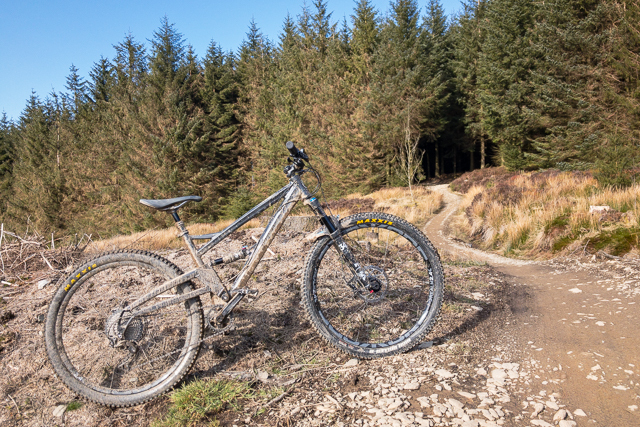 As both my Vitus hardtail and Orange Four got “new ride” posts on the blog, I thought Owen’s new Strider should too! 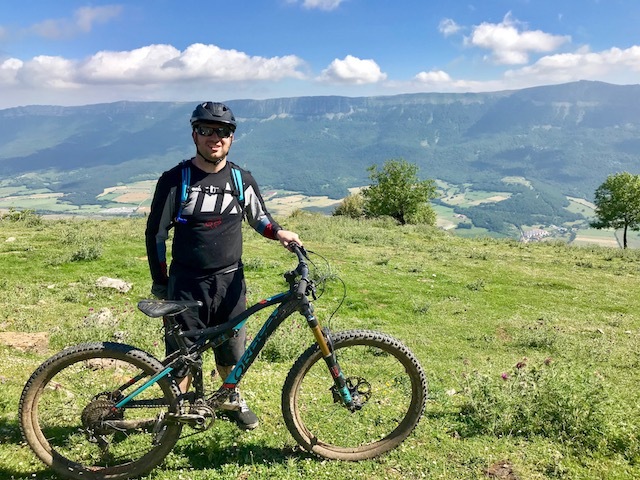 I’ve actually created a new section on my blog for kids MTB posts, hopefully there will be a lot more of them in future, as Owen gets through new bikes as he grows in size and becomes a better rider! I probably spent as much time researching Owen’s first bike, as I did my Four. Buying a balance bike is a bit of a minefield, there are loads of different options, made from wood, plastic, steel and aluminium ranging from £20 to £200! Fairly early on in the search I decided that I was going to resist the expensive, but clearly better aluminium balance bikes, my logic being that if I’m going to splash out on a bike for Owen, I should wait for his first pedal bike. I also didn’t want to go for a cheap rubbish one, Owen probably wouldn’t know any different, but I want to nurture his love of bikes, not kill it with a crap, heavy first bike! 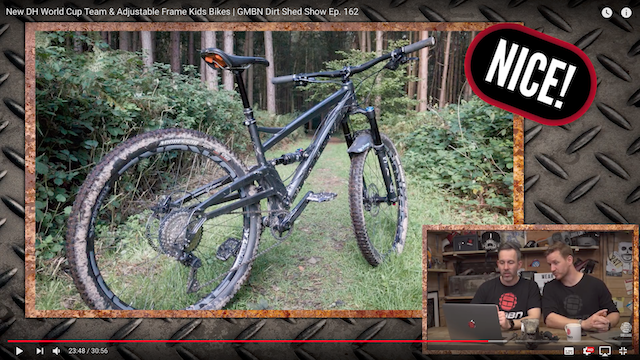 There were a few options in the middle ground, the Vitus Nippy was an early favourite as it had an aluminium frame, and the bonus of being the same brand as Daddy’s bike. However, the more I looked into the Striders the more I liked them and especially the community around them – something which has made my Orange ownership experience even better. The plan had been to buy it for Owen’s second birthday, but Owen seemed ready for it, and I was impatient, so ended up ordering it early. Inadvertently ordering it on the first day the new 2018 models were available. 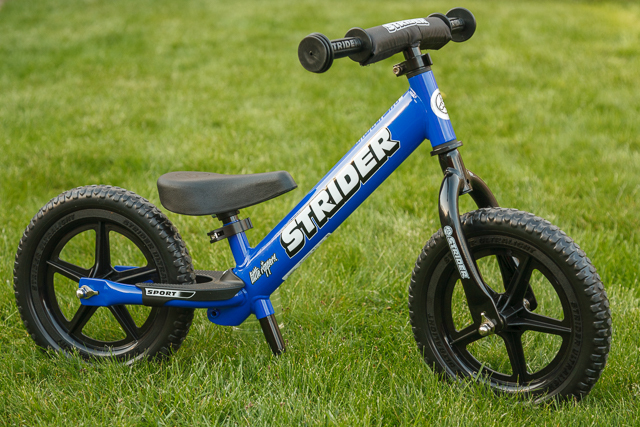 I went for the middle of the range “Sport” model, as it was cheaper than buying the base model, then the upgrades, I had been expecting free entry to a Strider Cup race, but annoyingly that had been discontinued for 2018 (in lieu of a price rise, so I can’t complain). The aluminium “Pro” version was just a bit too much of a price jump for me. I had the bike delivered to work, and managed to sneak it into the garage to build it, which was just a case of fitting the front wheel/fork assembly, fitting the handle bars and tightening up the clamps. I then leant the bike up next to my Orange and went into the house to see Owen, like any other day. Then, just like any other day, Owen asked to go into the garage to look at bikes and “Daddy sportscar” (my MR2) – his little face was a picture when the door was opened to reveal a small bright blue balance bike propped up next to my bike. He knew exactly who it was for! We got Owen to sit on the bike, he looked very pleased with himself, but he wasn’t keen to ride it. For the next few days he was happy enough just spinning the wheels, or asking to borrow my Allen keys, so he could “fix” it. I guess that is what comes from him seeing me fettling my bike more that riding it, as that happens when he is asleep! I was slightly disappointed and concerned that maybe he was too young for the balance bike. To remedy this I thought I’d go through how to pick up the bike and walk along with it, using my bike and getting him to copy – it didn’t take long until we were racing each other up and down the garden! After I’d put my bike away, Owen was riding down the path to the house and cracked a massive smile when he realised that he could go so much faster on the path than on the lawn. Since then he has been getting more confident, but still calling the balance bike “big” or “wobbly”, so I have a bit more work to do – especially as I have entered him into a race on the 15th June! 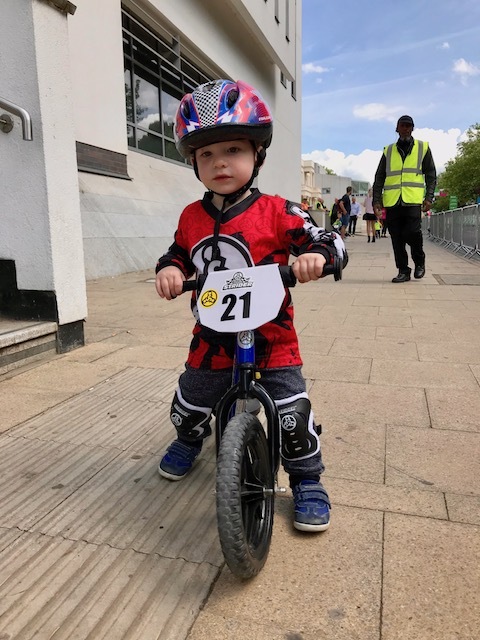 Hopefully more garden races and maybe a few sessions on the Strider track at Birmingham BMX track with Ready Steady Riders will prepare him for the race. In any case, I’m sure he will be spurred on by seeing other children on bikes! As a note, we bought Owen a Scuttlebug trike late last year, after seeing how happy he was sat on our friend’s trike when we were in York last summer. Owen called it his “bike”, and loved sitting on it, but it is very much a plastic toy, rather than a proper bike, unlike like his Strider – which I am classing as his first bike!